HS10 electronic solder wire is a proven product of our research - it has been developed for particularly high quality requirements in industrial production applications and for fast repair and resoldering work. 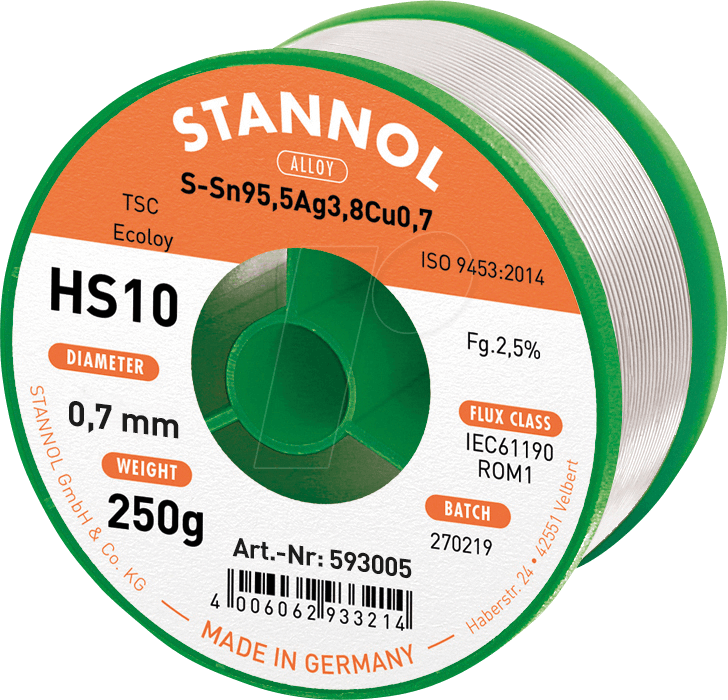 HS10 solder wire boasts excellent characteristics for high levels of activity, i.e. fast spreading and electrically safe residues. The HS10 wire flux consists of halogen-activated natural resin (colophony), meaning that it conforms to IEC 61190-1-3 type ROM1. HS10 solder wire can be used for manual and robot soldering within the electrical engineering and electronics sectors. The flux residues can be left on the solder joints. If cleaning is required for visual or technical reasons, the Stannol Flux-Ex 200B or Stannol Flux-Ex 500 cleaning agents offer effective cleaning.